We can either propel ourselves to a healthier lifestyle or we can settle for just mediocre health. 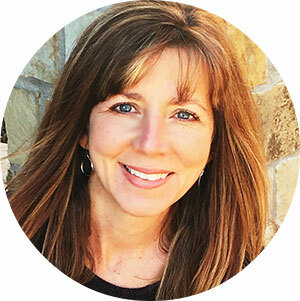 I turned 50 in 2017 and I know what I do the next few years will have a big impact on my health in my 60’s and 70’s. My goal for you is to not wait until you are 50 to think about your health in this way. Start now. Whatever your age. If you are younger you have more time. If you are older than me, then it’s time to get busy. Everything we do now will affect us later down the road. Some of these ideas won’t be new to you but if you are like me they are easy to forget or put off. Some are really simple but may make a big impact on your emotional health which in turn will affect you physically. 1)Eat Less Sugar – I put this one first because it’s probably one of the most important health habits we should all adopt. Sugar impacts our health negatively in so many ways yet it is so hard to kick the habit. For most us, small changes like skipping the daily sweet treat could make a big impact on our health down the road. If you struggle with sugar as I do then read my 7 Day Sugar Detox for some ideas on how to eat less sugar in 2019. 2) Move More – Set a goal of getting in 15 mins more exercise this week. Try simple indoor activities such as dancing to music, or setting a timer during household chores forcing you to work faster and harder, thus burning more calories. One of my favorite quick workouts to get your blood flowing is Zach Bush’s 4-minute workout. Watch the video and learn how powerful it can be for your overall health. 3) Stay Hydrated – It can be hard to remember in the winter that you still need plenty of water to stay healthy. It’s so cold and dreary that you may not realize that you still need to drink your 8 glasses a day. 4) Try A Nutritional Cleanse – We are exposed to toxins every day. If you’ve had trouble losing weight this last year you should consider how the toxins are affecting you. Toxins hold fat and an easy way to cleanse them from your body is by doing a nutritional cleanse. My favorite is the Isagenix Cleansing System. Most people do well with the 30 Day System but a quick 9 Day Cleanse might do the trick for you. 5) Spend Time Alone – You’ve had a lot of togetherness with the recent holiday, now’s a great time to find time to spend with yourself. Read an educational or uplifting book. 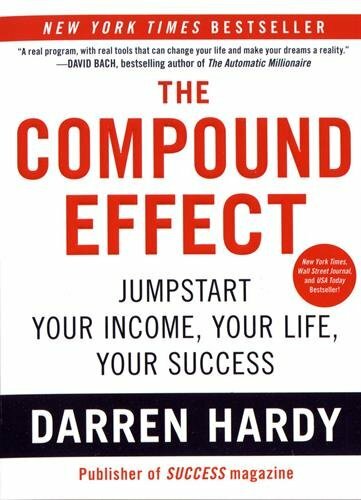 A recommendation is The Compound Effect by Darren Hardy. 6) Buy more houseplants – Plants detox the air of your home. Clean air is important and often something we take for granted. Toxins affect our health in a big way. Consider getting a few plants for your bedroom so you are breathing in toxic free air while you sleep. 7) Avoid Sitting Too Much – Most people have sedentary jobs these days. Try to get up and walk or move around every 90 minutes at least for about three to five minutes. For example, walk to deliver documents to people instead of emailing them. 8) Keep Healthy Snacks Nearby – Depending on your diet, it’s important to have snacks nearby to avoid problems with being overly hungry. A small package of nuts, an apple, a banana or something equally healthy is a good choice. 9) Try Intermittent Fasting – IF is just delayed eating. When you intermittent fast it allows your body to restore itself, burn more fat, and fight aging. Read my Ultimate Guide To Intermittent Fasting for more details. 10) Get a Bike – You can find used bikes at good prices these days at consignment stores or through Facebook seller groups. A bike is a good way to start exercising even if you’re not in the best shape. I found when I go on short rides around the neighborhood with my family I feel refreshed and energized. 11) Avoid Toxic People – It might be shocking to note that negativity can play a huge factor in your health. The more negative you are, the more negative the people who surround you are, the less healthy and happy you’ll be. 12) Ditch Technology – When you can, turn off all your electronics. Turn off your notifications on your phone, on Facebook, and inside your home. Try to spend a few hours after dinner each night without this technology. Research indicates the light of our devices messes with our sleep if we use them before bed. 13) Be More Empathetic – Attitude is more than 80 percent of the reason you either feel good or bad about anything. But, empathy is something that is necessary to feel good about people. The more love and care you have in your heart for others, the more it will trickle down to you. 14) Eat More Salads – You can eat all the fresh salad your heart desires if you avoid sugary and fatty dressings. Try making a dressing with raw fruit, vinegar, and spices blended for a natural alternative. Get more veggies in your regular food by shredding and adding to any casseroles or saucy dishes. For example, shredded zucchini goes great in lasagna or spaghetti sauce and no one will notice. This shredder comes in handy. I admit I don’t get enough vegetables in my diet and I hate green smoothies so I supplement with Isagenix Greens. 15) Plan Meals – One of the biggest factors in success for any diet is planning. Your plan can be as simple as substituting healthy protein shakes for some of your meals or it could be making a meal plan for your whole week. Whatever way you do it plan before you shop, and then plan before each day so that you’re never in a hurry and tempted to run through a drive-through. 16) Think Before You Speak – One thing that often interferes with your happy life is your mouth. Your mom was right. If you can’t say something nice don’t say it at all. Even if you mean for it to be nice, just stop. 17) Learn Something New – Keeping your mind active is an important part of being healthy. Focus on learning something new this month. last year and learned a lot. 18) Use Essential Oils –Essential oils can help your immune system, calm anxiety, and help you reduce toxins in your home. I’ve written many articles about them. Get my free Essential Oils for Beginners Ebook here. 19) Learn Chair Exercises – One great way to combat a sedentary lifestyle is to learn about chair exercises. You can do quite a workout right in your office chair as you work. Try this workout by HasFIT. 20) Get More Sunshine – Now that the weather is better, try to get more sunshine. You need it for vitamin D production. If you’re unable to get at least 20 minutes of sunshine a day you may want to supplement with vitamin D. This is the brand I use. 21) Invest in a Standing Desk – A great way to combat getting a bigger rear-end from sitting a day, along with blood clots and other things that happen to sedentary people invest in a standing desk so that you can stand and work. 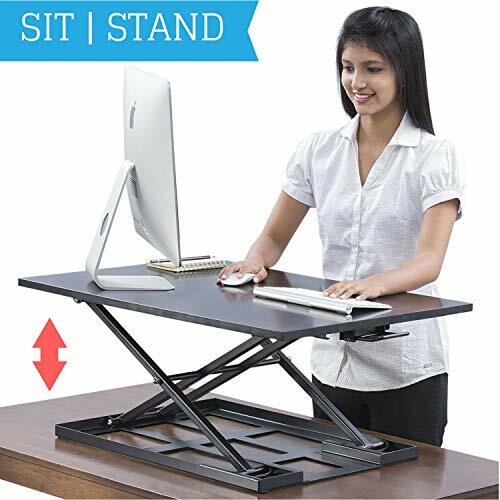 If you already have a desk you can buy this desk converter. 22) Wear the Right Shoes – When you exercise or just walk around normally the right shoes are important. High heels are especially bad for women’s health. Sure, you must for work, but when you need to walk have some shoes to switch into that are better for you. 23) Go to The Dentist – You should be getting professional cleanings twice a year to avoid problems. Many people don’t realize that poor dental health can lead to more problems than just mouth pain, like heart issues. 24) Laugh More – Laughing is the best tummy exercise you can do. Not only that when you laugh you release feel-good endorphins that will make you feel good even if you’re feeling unwell that day. 25) Eat More Raw Fruit & Veggies – The original fast food is good for you no matter what anyone else says. The sugar and fat in fruit are always better for you than any other food. Switch out snacks and other processed foods for raw fruit and veggies and you’ll notice fewer cravings within about a month. 26) Eat More Healthy Fats – Fats don’t make us fat. Sugar makes us fat. We need good fats like olive oil, avocados, grass-fed butter, and coconut oil to help keep our skin and brain healthy. Instead of sugar-laden salad dressing try a drizzle of olive oil. Add some avocado to your salad. Make guacamole and use carrots instead of chips to dip in it. 27) Be More Generous – You don’t want people to take advantage of you but focus on being more generous when you can and it will rub off on your feelings about yourself. 28) Park at a Distance – You can get more steps into your day by parking far away from every entrance. Not only will you be walking as you shop or run errands but you’ll get in those extra steps that can make a huge difference in your fitness level. 29) Take Martial Arts Classes – Whether you choose Taekwondo or another form of martial arts you’ll get healthy without feeling as if you’re exercising and gain confidence in yourself which will give you a better attitude. 30) Get the Family Involved – Whether it’s cooking a healthy dinner or it’s moving more if you get the entire family involved you’ll also be making amazing memories. 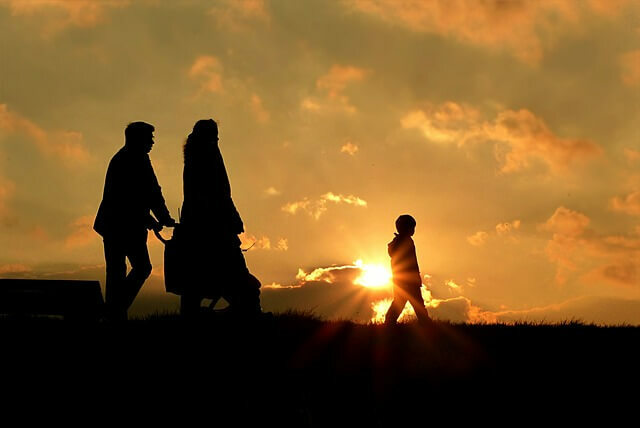 31) Bring Back the After-Dinner Walk – Before we got so busy it was normal for people to take leisurely after-dinner walks around the neighborhood. People would stop and chat but also get needed fresh air and exercise. 32) Get Enough Sleep – If you find that you’re going to bed on time and still are sleepy during the day get a physical to rule out health issues such as sleep apnea. This can affect even thin people so don’t assume you don’t have a health issue that is keeping you from getting sleep. 33) Write Down Goals – If you have any goals in relation to your health and well-being it’s important to write them down. Not only that, write down how you’ll achieve them so that you’ll have a map to follow. 34) Don’t Compare Yourself – As humans, we have a strange compulsion to compare ourselves to others when it comes to weight and looks. But, this is not a good thing to do because everyone’s situation (and genetics) are different. Feel good about what you have and work to make it better in a realistic way. Stay off social media if you find it drags you down when you see what your friends are up to. Remember, most people don’t post the negative in their life. We only see the happy stuff. 35) Stop Drinking Soda – Whether you call it pop, soda, coke or soft drinks they’re very bad for you. They’re not even a real beverage. If you like the fizzy feeling you can replace your soft drinks with naturally carbonated waters and juices. My favorite fizzing drink is Kombucha. You can learn to make your own or purchase it at most grocery stores. 36) Get Accountability – There are many ways to get an accountability partner now. You can look close to home or you can look across the country using Fitbit and other online communities to help you stay on track with your fitness goals. 37) Improve Your Gut Bacteria – A lot of people who have gas, GERD, and other issues really have poor gut bacteria. You can get tested for the H. Pylori infection if you’re concerned. You can also add in healthy bacteria through supplementing with probiotics. I’ve written about the brand I use here. 38) Learn a New Sport – Exercise is simpler if it doesn’t feel like exercise. Taking a class in a new sport such as tennis or golf can help turn an exercise into a hobby. Dave has always played soccer but I never learned it when we were young. However, now that he started coaching our girls’ soccer team I started learning with them. It’s been a great way to get more exercise and bond with my girls. Have a child who plays soccer? You might like my husbands website Home Soccer Training. 39) Learn Good Posture – Most of our moms tried to keep our posture good, but even sometimes their directions of “shoulders back” might be incorrect and cause back pain. If you’re not sure, go to a trained physical therapist to help you. Watch this video for some tips. 40) Get a Colonoscopy – If you’re 50 or older, or you have blood in your stools or are often constipated consider getting a colonoscopy. Today there are noninvasive testing that you can do as well. Regardless of which method you use knowing the health of your colon is important and may save your life. 41) Get a Massage – Any time you have worked extra hard at something consider getting a massage. Manually stimulating the body can improve blood flow, increase metabolism, and speed repair after working out or working hard. One of the at home massage tools we use is a Fascia Blaster. Read more about it here. 42) Take Vitamins – Most people need to take supplements because they don’t get enough variety in their diet (including me). You can get a blood test to be sure. But, if you’re tired, certainly look into Vitamin D and magnesium. 43) Try Yoga – One of the best exercises for most people in most stages of health is yoga. There is a practice at the right level for almost everyone. Check with your local gym or YMCA to find classes in your area. 44) Moisturize – It’s important to keep your skin moisturized. You’ll feel better and age slower if you do. But, ensure that whatever you’re putting on your skin is natural and safe. Read about the 6 Top Plant Oils For Anti-Aging skin care in my post here. 45) Don’t Box Yourself In – There are a lot of “shoulds” in life. Try to get rid of as many as you can. For example, you should exercise every single day, but what if instead of exercising you played and had fun? 46) Don’t Judge Others – This is for your own mental health. When you find yourself judging others based on arbitrary traits you’re really judging yourself which can make living with yourself difficult. 47) Make Work Fun – When you need to clean the house or do chores you don’t want to do find a way to make it more fun. Ask someone to help you, turn on the music, and enjoy the fact that you’re alive as you do the tasks. 48) Remember Your Goals – Each day when you get up, take the time to look at your goals so that you know what you need to do that day to get closer to succeeding. Every goal is met one day at a time. 49) Quit Bad Habits – If you smoke, drink more than three drinks a week, or eat more chips than you’d like, it’s time to stop those habits. The best way to do it is to attack one at a time replacing it with a healthy habit. 50) Add Some Weight – After you’ve been walking for a few weeks, it’s time to up your game. Get some ankle weights which will add to the difficulty of your walk and help you get more out of less. Go to the gym or get some light hand weights to use at home. You might like these fat burning workouts to do at home. 51) Avoid Processed Food – Even when the label says it’s healthy if it’s processed you can do better. Shop the perimeter of the grocery store, stay clear of aisles and you’ll find it easier to find whole foods. 52) Start Your Day Right – Most research shows that people who work out first thing in the morning as a habit are more likely to stick to the plan. But, if you’re not a morning person that’s okay, just do whatever you’re going to do as soon as possible each day. What do you think? See anything on this list you could start implementing?